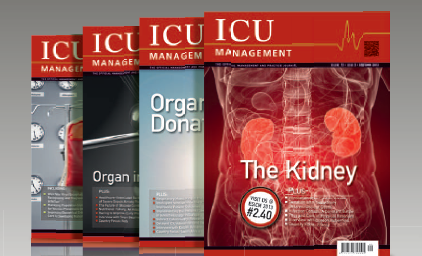 We would like to share today the article published on February 3 on the HealthManagement.org blog, and that will come out in paper in the next issue of ICU Management, the journal whose editor in Chief is nothing more and nothing less than the Professor Jean-Louis Vincent, head of the ICU of the Erasme Hospital in Brussels. From the Journal, they got in touch with us to write an article to encourage other health and intensive care professionals to create a blog. 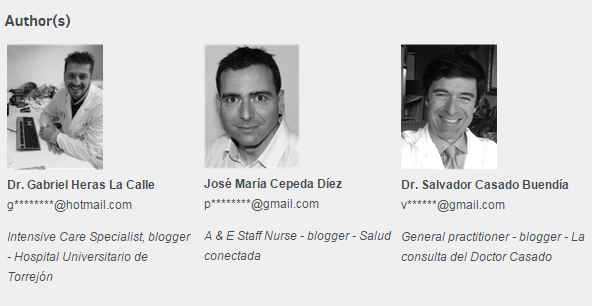 Without hesitation, contacted Salvador Casado (La consulta del Dr. Casado) and José María Cepeda (Salud Conectada), whom I consider a reference in Spain to invite them to write the article alltogether. The continuum of care is part of the biographical process of our patients, and it seemed logical that a general practitioner, an A & E Staff nurse and an Intensivist, all bloggers, share this opportunity and write about the topic that we had commissioned. And this is the result. I present the article Getting Started With a Health Blog, which we hope will be useful and encourage you to be a part in the blogger world. Many thanks to Salvador and Chema, it was a pleasure to work with excellent professionals who in addition, they are better people and looking to change what we have in the present in order to have a more favourable future. whereas up front it would appear costlier to eat a healthy dish than to splurge for nutrition, by preventing malady through healthy habits folks square measure saving cash within the end of the day, and that they square measure finance into their own eudaemonia, for more information click here suboxne 33410.